We live in an age of greater social mobility so people are coming and going all the time. However, the East of England Plan suggests far more people will be coming to Hatfield than going – for the next few years at least. If you're one of them, welcome to Hatfield. Hopefully, you won't need any of the emergency services but if you're in a life-threatening situation dial 999 (the operator will direct you to the control room of the relevant service). For less demanding situations the information below may help. Hatfield comes under the Hertfordshire Constabulary. The Hatfield Police Station and courts are now housed in the former de Havilland Aircraft Company buildings on the old airfield. Please note: the front counter is not manned 24-hours – usually only till 23:00 hours (except on Sundays). For non-emergency calls they can be reached on 101 or 01707 354000. You also have the option of reporting crimes to the charity Crimestoppers on 0800 555 111, where you do not have to give your name and you could be entitled to a cash reward. Prevention is always better. The Fire Service is happy to provide advice on installing and maintaining smoke alarms and ways of keeping you and your family safe. For medical emergencies, the East of England NHS Ambulance Trust provides the service for Hatfield. The Trust was created on 1 July 2006 by merging the three services covering Bedfordshire, Cambridgeshire, Essex, Hertfordshire, Norfolk and Suffolk. Please note: there is no Hatfield office – ambulances are based at strategic points. The nearest accident and emergency service at the QEII Hospital, Welwyn Garden City is being relocated to Lister Hospital, Stevenage. There is also an aerial ambulance service. For general medical advice or if you're wondering whether you need to call an ambulance telephone NHS Direct on 0845 46 47 48 or refer their web site: http://www.nhsdirect.nhs.uk. NHS Choices – your health, your choices. It replaced the Hatfield Parish Council in 1988. Hatfield Parish (a parish originally was the area covered by a church, which became an administrative area as well) covers an area of 11,489 acres or 17.95 square miles. It stretches from the village of Newgate Street in the south to Lemsford Village in the north. Hatfield Town Council is mainly responsible for looking after the recreational parks, public spaces and a few facilities like Rowe Hill and Oxlease House (the hall and a few others are available for hire). Please note: Hatfield resembles London in that the town has two mayors – a town council mayor and a borough council mayor. Registration of births, deaths and marriages (there is an office in Hatfield – For details please see Births, Marriages and Deaths). The Citizens Advice Bureau (CAB) started life as an emergency war service. On 4 September 1939 – the day after war was declared – the first 200 opened their doors. Today there are nearly 450 across the British Isles. They are independently registered charities which provide free, independent, confidential and impartial advice to everyone on their rights and responsibilities on a wide range of subjects including finance, housing and family issues. The Hatfield office is located in Queensway House. Access is either via the metal stairs by the side of Blockbuster or by using the entry phone located at the entrance closest to the Hatfield Public Library entrance. Please note: opening days and hours at the Hatfield branch are limited (at the time of writing: Mondays, Tuesdays and Thursdays). 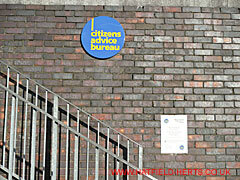 Details can be found on the notice by the stairs (shown in the photo) and on their Citizens Advice directory entry – Link. Hatfield is represented at Westminster by the MP for Welwyn Hatfield. Any of them could be contacted regardless of where their offices are or political party. However, as different MEPs sit on different committees it is naturally better to contact those who are more involved in the issue being raised.